How to make light, pillowy ricotta gnocchi from scratch in about 30 minutes. 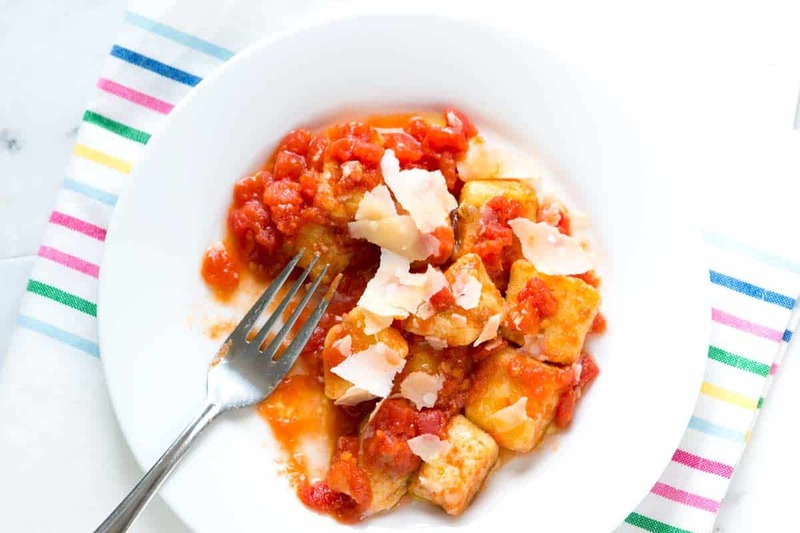 Jump to the Ricotta Gnocchi Recipe or read on to see our tips for making it. I am so excited to share this ricotta gnocchi recipe with you! We’ve talked about it for months and made it more times than we can remember. This is a major go-to recipe for us. 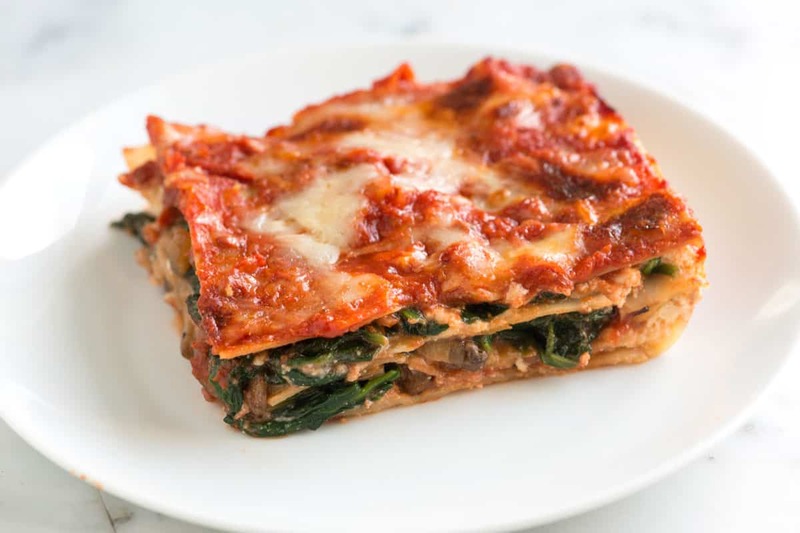 YOU MAY ALSO LIKE: Healthy easy spinach lasagna recipe with fresh spinach, flavorful mushrooms, light tomato sauce, and cheeses. A delicious meatless lasagna. Jump to the full Spinach Lasagna Recipe. It’s easy. We promise. The dough literally takes less than 15 minutes to make. In a large bowl, we combine lemon zest, parmesan cheese, an egg and ricotta cheese with flour. After 20 to 30 strokes of a spoon, the dough is done! Then all you need to do it turn it out onto a work bench, divide the dough into four, and roll into long ropes. 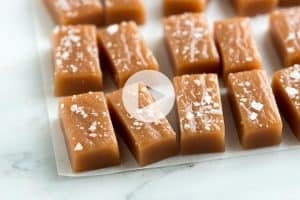 Cut the ropes into bite-size pieces and throw them onto a sheet with flour. (The flour prevents them from sticking). From here, you can make gnocchi straight away or freeze for later. Since it’s the two of us, we usually make half the batch and freeze the rest for another day. 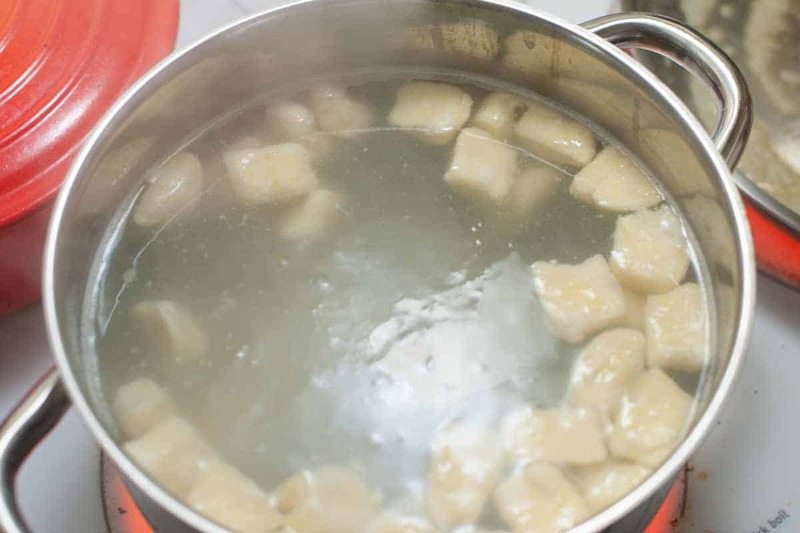 To cook gnocchi, bring a pot of salted water to a boil then cook (just like pasta) for 2 to 3 minutes. You know they are done when the gnocchi float to the top. There are lots of ways to serve ricotta gnocchi. 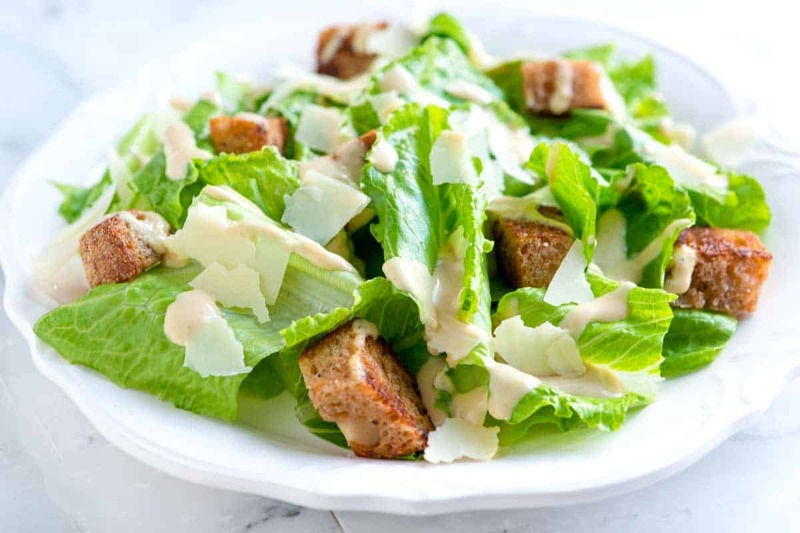 It’s excellent plain tossed with a little olive oil, parmesan cheese, and herbs. Our favorite way to serve it is to add a buttery crust and toss with a light marinara sauce. The beauty of this recipe is that it really only takes 15 minutes to make the dough. After that, you can cook it — which takes 2 to 3 minutes — or save it for another day. To freeze, throw onto a baking sheet with a little flour. (The flour helps to prevent the gnocchi from sticking to each other). Slide the baking sheet into your freezer and wait until they are hard – about 1 hour. Then throw into freezer bags or an air-tight container. When you’re ready to cook, throw them into boiling water and cook until they begin to float. Making restaurant-quality ricotta gnocchi is easy to do at home. You can make the dough in under twenty minutes then cook or freeze for later. 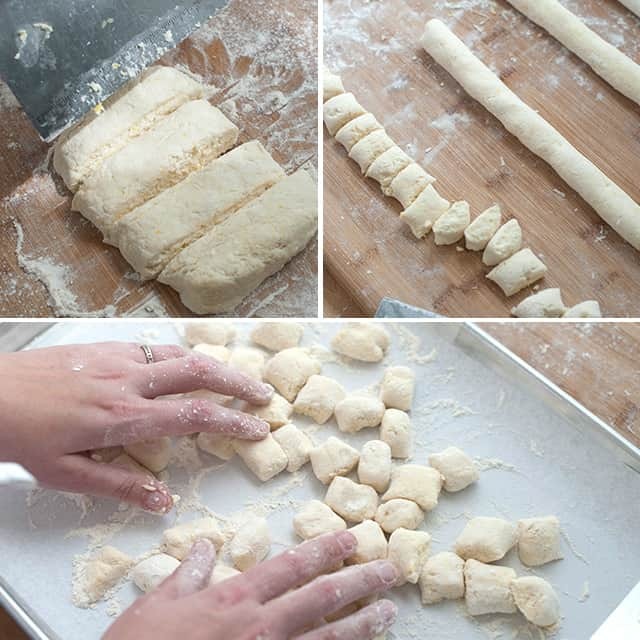 Directions for making the dough, cooking gnocchi, and freezing are all shown below. There are lots of ways to serve ricotta gnocchi. It’s excellent plain tossed with a little olive oil, parmesan cheese, and herbs. Our favorite way to serve it is to add a buttery crust and toss with a light marinara sauce. We have shared how to do this below. Line a baking sheet with parchment paper or aluminum foil. Scatter a few tablespoons of flour on top. Mix 3/4 cup of flour, parmesan cheese, and lemon zest in a large bowl until well blended. Make a well in the center of the flour mixture then add the ricotta cheese and egg. Using a wooden spoon, stir until the dough comes together. The dough should come together within 20 to 30 strokes of your spoon. 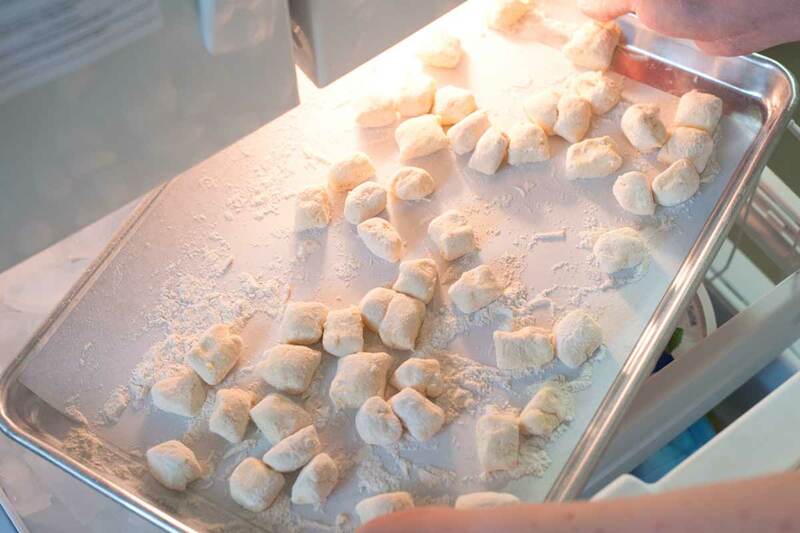 To keep the gnocchi light when cooked, be careful not to overwork the dough. Transfer dough to a well-floured work bench and pat it together. Shape into a rectangle then cut into 4 even pieces. If the dough is tacky, add a little more flour. Gently roll each piece into a 12-inch long rope about 3/4-inch thick, adding more flour as necessary to prevent sticking. Cut the ropes into 3/4-inch pieces then transfer to the prepared baking sheet with flour. Shimmy the baking sheet so that the flour lightly coats each piece. Cook gnocchi or freeze for later (see notes). Bring a pot of salted water to a boil. Add gnocchi and cook 2 to 3 minutes or until the gnocchi begin to float. As they finish cooking, use a slotted spoon to remove from water. 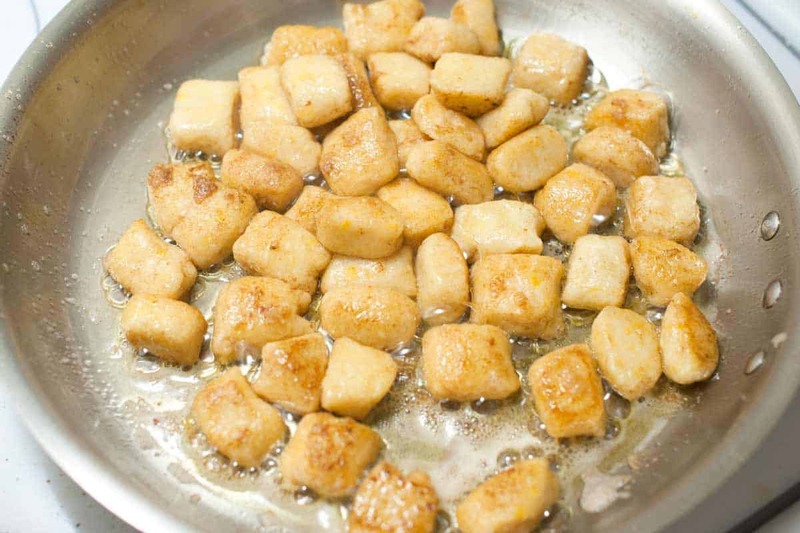 If serving with butter and marinara sauce, while the gnocchi cook, melt butter in a wide skillet over medium heat. When the butter is bubbling add the cooked gnocchi. Cook, shaking the pan occasionally, until gnocchi has browned on all sides, about 3 minutes. Toss with warmed marinara sauce and serve topped with parmesan cheese. To Freeze Gnocchi: Place baking sheet with gnocchi into freezer and freeze for about 1 hour or until the individual pieces aren’t sticking to each other or the pan. Transfer the semi-frozen gnocchi to airtight bags. Keep in the freezer for up to 3 months. When you are ready to cook, remove from freezer and cook from frozen using directions above. This recipe has been adapted and inspired by Michael Symon. These were absolutely delicious and easy to make. My family loved them, thanks for this great recipe! Could this be made with almond flour to lower the carb content? Hi Patti, that’s a great question and it might need some testing on your end. I would imagine that the recipe would work out nicely, though. This is so easy and delicious, there is no need to buy gnocchi. And it tastes so much better! This is the only gnocchi recipe I use and I make it often. 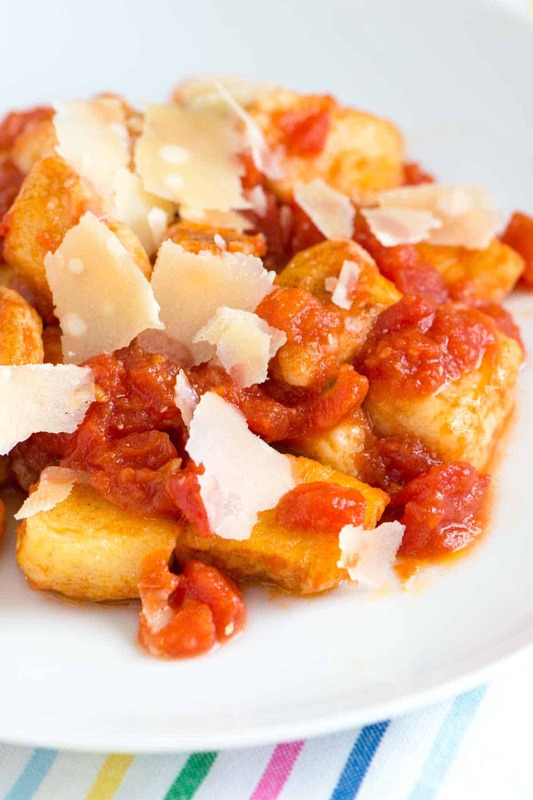 I am so excited to try this Ricotta Gnocchi recipe. Gnocchi has always been my all time favorite pasta but the potato version always feels so rich. Any chance you have the nutritional facts for this recipe? OMG! I am so excited! I made this recipe gluten free and they were spectacular! I added a few gratings of nutmeg and some freshly ground salt & pepper. Half the batch I added some thinly sliced, fresh from the garden, basil. Delicious little pillows of heaven! I haven’t even tried them in the browned butter yet! So happy when I can eat something not easily obtained in the marketplace. Thank you! I have made these gluten free as well, and they turned out great! Any good quality all-purpose gluten-free flour works well. I have used Cup 4 Cup and Better Batter. Both already contain xanthan gum. I made this tonight and it was devine! A great recipe for a mid week meal. 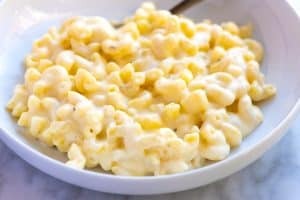 I have tried to find a ricotta cheese gnocchi recipe since my aunt died. Unfortunately, she didn’t leave her recipe. I tried the flour ones and they were too heavy and tough. I love your recipe. Thanks. Made this tonight, it was sooooo delicious, and incredibly easy! Thank you for this wonderful recipe, I’ll definitely be making this again- and will be sure to freeze some too! These are soooo delicious. The lemon zest adds just a perfect touch! Thanks for the amazing and simple recipe! First try and perfect gnocchi , simple to follow and delicious. Will make again..Thank you. I was wondering if it’s okay to skip the lemon zest? Yep, you can omit it if you prefer. Thanks so much for posting this. This recipe inspired me to try making gnocchi again after a gnocchi-fail a number of years ago. It really was easy and turned out great. I made a goat cheese version of the gnocchi that I love as well. Thanks so much! Using goat cheese is a fabulous idea! 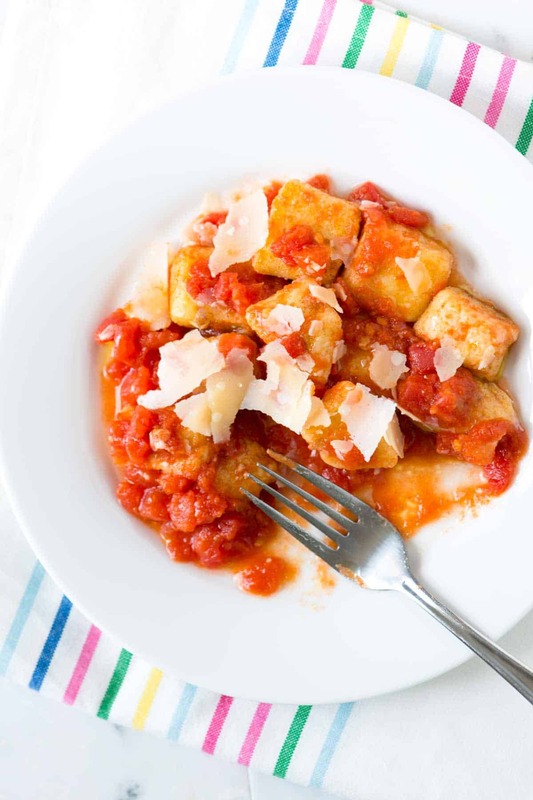 I wish making ricotta gnocchi were this easy!….. I watched my great grandmother (a true Sicilian) make these for the large family get together. It was an assembly line production with her 4 daughters. They are all gone now and as a labor of love for my husband and close friends, I spend 4 hours at a time making these for the freezer… I do this once every few years because it is a long project. My great grandmothers recipe, 1 container good quality ricotta, 2 eggs, 1 ricotta container full of all purpose flour. As like the recipe above roll out the dough and make the cuts. This is where it gets time consuming. Each piece, with your index and middle finger, press in the middle and then roll it… This creates a lip that allows the sauce to penetrate the gnocchi. A word of warning…. This version takes 4 hours to make… I know because I just made 2 batches over the last 2 days and it took a little over 8 hours. At least I know my husband won’t starve while I am layed up from surgery… I will just have to worry about his Cholesterol! On a closing note, if you don’t have time to make a homemade marinara.. Get a bottle of ‘Raos’ marinara at your supermarket. It’s a little pricey but worth every penny… I personally buy it by the case direct from Raos. Good luck and Bon Appetite! I made these this evening and they were easy and delicious as promised. I made them with part skim ricotta and a gluten free flour blend and they came out great. I will also use less lemon zest next time. Thanks for this great recipe! Yet another fantastic recipe from inspired taste! I’ve yet to make something from your site that I didn’t absolutely love. 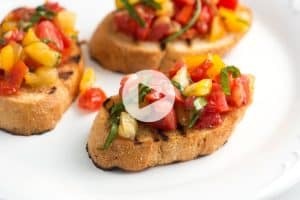 Besides tasting amazing, this recipe is incredibly easy and is pretty fast to make. I will use less lemon zest next time, but that is purely a matter of personal preference. Finally, an easy and delicious pasta recipe!! 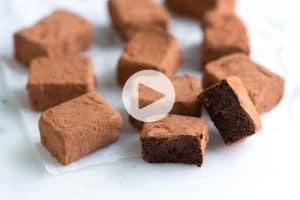 I’ve bookmarked this recipe! It looks amazing. I never really like the traditional potato-based gnocci because it’s just a bit too… potato-y for me, but I love,love,love ricotta so this is a must-try! Slide show worked for me, Looks great and easy can’t wait to try it! Looks awesome! Repinned it so I can try it later. FYI: your slide show isn’t working for me. Thanks! Sorry about the slider – Not sure why is isn’t working. We’ll look into it.